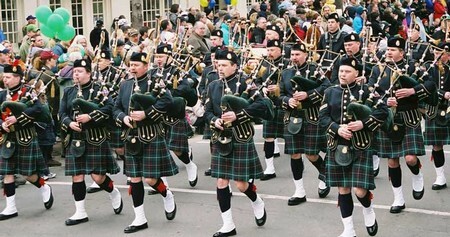 The traditional pastime of parades fills us with excitement and a sense of nostalgia. Who can pass up a Thanksgiving Day or Mardi Gras celebration parade? People stand curbside and cheer as the procession of high school bands, enormous floats and actors and politicians pass by the crowd. No matter what kind of entertaining parade you enjoy, the parades seem to outdo themselves in fun, excitement and visual spectacles every year. Parades also symbolize an integral part of human culture and history. The origin of the parade has its roots in the military and politics. Generations of rulers have projected their power through displays of strength and trepidation, going back to humanity’s first civilizations. Mesopotamian rulers decorated their buildings with illustrations depicting their conquests. Often the pictures depicted the ruler walking on the head of his conquered enemies in front of his army. The actions, designed to lift the monarch’s prestige, cemented his legitimacy as a ruler. Later parades functioned as broad podiums that connected the ruler to his audience and allowed him to spread his authority as he made his way through the crowds. Religious authorities and organizations used parades in much the same way as the military and politicians did before them. The parade offered a large platform for them to connect with the community and foster power. The public enjoyed the parades since they got a chance to be close to the powerful members of society who passed by. Many parades became associated with fairs and festivals. People came together to socialize and learn about recent news. Citizens could have fun times in the middle of misery in medieval times as the circus parades and brightly painted carreros (carts) of Italy brightened people’s lives. The public anticipated such events, and the parades developed a flashy and exotic mood. The fleeting moments provided great pleasure and an escape from everyday life. Modern parades expanded the exotic and flashy parade and added a sense of excess to them. Mardi Gras and Carnival parades stem from the religious obligations associated with Lent. Parade revelers and participants put on masks and costumes, dance provocatively, and ignore social conventions during the celebratory weeks of the festivities. Military parades starkly contrast with the festive carnivals. Military parades often feature disciplined marching with historical salutes and drills. The style of marching originated with the Prussian army, and many armies around the world copied the strict disciplinary lock-step. Parades in many countries display these marches to demonstrate military hardware and memorialize the past sacrifices of soldiers in times of war. One of the largest parades today is the Macy’s Day Parade that started in 1924. The parade started the tradition of a parade used as advertising. The parade, started by Macy’s employees, featured animals from the Central Park Zoo. 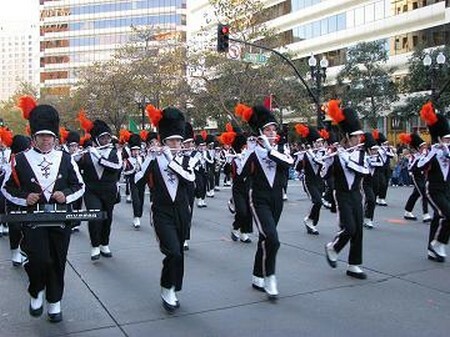 The first parade, considered a huge success by its organizers, became a yearly tradition. Companies pay thousands of dollars to display their brand on rolling floats and cartoon character balloons in the Macy’s Day Parade. Three million spectators watch the annual parade as it winds its way through Manhattan, and four million viewers watch it on TV. Its the Macy’s THANKSGIVING Day Parade. A small detail you conspiculously left out. Afraid mentioning something that gives thanks to God will offend someone?